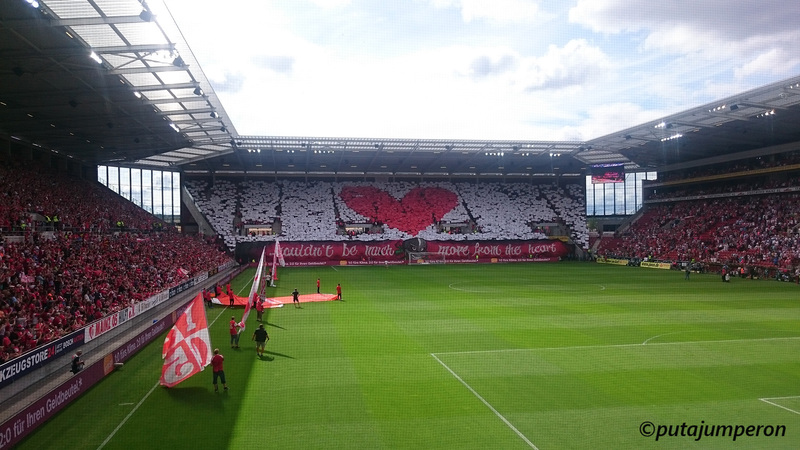 After an hour’s preparation in the away end – affixing banners, hoisting flags and organising terrace positions – the warm-ups gave way to (someone other than Gerry Marsden) singing You’ll Never Walk Alone and then, a very impressive three-part, full stand, eulogising tifo display from the Mainz ultras opposite us (something that was equally appreciated by die Gäste) as the teams entered the field. Suddenly, the Springsteen covers from our Robert-Elms-podcast drive down were blown from my ears as the nearby drummer thundered headlong through countless southern chants. 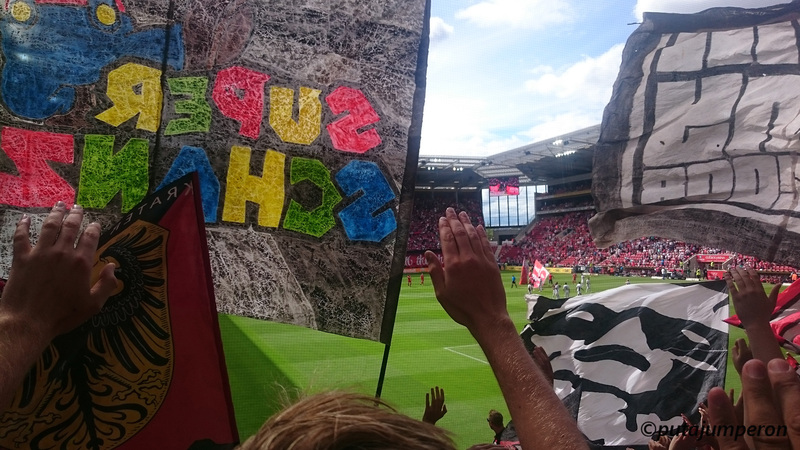 Pre-match nerves gone, the Schanzer settled quickly into the pace of the new division. No longer were they overawed, either on or off the pitch. This was theirs to enjoy whatever the day may bring. As the players tested respective defences, the first clear opening fell to the visitors as a low drive was rifled wide of the near post. With my view temporarily obscured by one neighbouring flag; whether it came from the foot of 10 (Pascal Groβ) or 16 (Lukas Hinterseer) I’ll probably never know. Still it was a sign; an indication that all things may well be possible. Mainz countered with two free-kicks in quick succession, both of which flew over the intended target. Without any recognition of such good fortune, increasingly voluminous songs continued to flood the space about the away end. The drummer was now so close, I could hardly hear myself think. Fortunately such sense was unnecessary to appreciate – Ingolstadt captain – Marvin Matip’s spectacular interception on Jairo Samperio, who was tearing down the left. Whilst Matip’s was a leader’s performance throughout the afternoon – from kick-off to post match celebrations – the huge day for the visitors wasn’t going quite to plan up front. On the half hour, a stunning outside-of-the-boot strike swept past the target, closely followed by a free-kick, on an almost identical trajectory. This brought with it the bonus award of the first yellow card for the hosts who were having similar sight-setting issues, both with and without the ball. Though the eventual halftime whistle was greeted with a rich blend of congratulatory noise and anxious giggles; honours were very much even on both the goal and card front. On the performance alone however, it wouldn’t be an exaggeration to claim Ingolstadt had just edged the proceedings. Underneath the stands, you could still taste the nervous anticipation in air. The enormity of the day was obvious but, was the game actually relevant in comparison? Did the score actually matter? It was hard to tell; the last time I’d seen such elated faces Anthony Knockaert had just missed a penalty, twice. Breathless visitors quenched their thirst whilst I pleasingly managed to reacquaint myself with The Scottish Schanzer (entertainingly they’re always about somewhere) and then in no time at all we were all back out there; the game rushing by at a hundred miles an hour. This was a first. Savour the moment. Enjoy every bit of it… It was impossible. In the weeks preceding – with national media rightfully pawing over romantic tales of phoenix-like Darmstadt regaining top flight status – it seemed Ingolstadt were allowed to slip in under the radar. Did that afford them better preparation? Maybe. Were they able to relax and play now; the pressure off? Probably not but, the end to end action of the second period gave away little as to which were the new kids on the block. What time did the all-important goal go in? Without double checking, I’m buggered if I know. The half started with a brace of yellow cards as both sides pressed, desperate to seal the points. 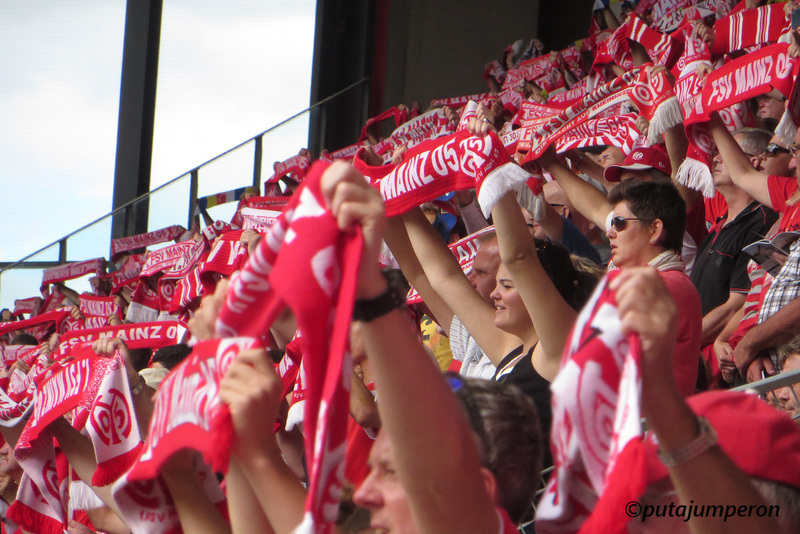 Mainz were rejuvenated; initially much the stronger side. On seven minutes, Die Nullfünfer had the ball in the net. It all seemed inevitable. The singing from the away end continued throughout the stadium’s jubilant eruption and also, through the subsequent complaints, as the linesman flagged for some aberration up the far end. Between the yellow cards, the disallowed goal was followed by a stunning save from Ramazan Özcan and, a quick substitution as Ingolstadt attempted to reverse the trend. Elias Kachunga came on for Moritz Hartmann and five minutes later, Lukas Hinterseer ran down the left, cut inside, and curled the ball deftly round the keeper. Suddenly all the pent up adrenalin of a small corner of the Coface Arena burst its defences. Even the drummer, hindered by a halftime injury was dancing about again. Twenty-four minutes were left on the clock. Twenty four long minutes for the little team – who’d scored against the run of play – to hold on. TWENTY-FOUR MINUTES of substitutions and reorganisations and tense close shaves at either end. The drum pounding beside me, mirroring the chants and heart-beats of those souls in the away end. Twenty-four minutes was an eternity hurtling past at the speed of light… Then, as it curtailed, another three minutes were added before an almighty explosion as pent-up relief collided with sheer disbelief. The united celebration of the few would be etched forever. Back through the away entrance underpass, loud mantras rang out, as selfies captured the moment that little Ingolstadt won their very first ever Bundesliga match, at the very first attempt. In a totally honest appraisal of all that had gone before, later that night, one tweet read “Sehr müde, sehr glücklich, sehr dankbar. Gute Nacht”. It was the kind of day that every sports fan would want for their team; an event to one day tell your grandchildren about. An “I WAS THERE WHEN” moment… A record breaking milestone worthy of undivided praise. So why then is this not universally perceived so in the Bundesrepublik? As a new-comer to Germany, I survey this issue with an unbiased mind. Yes – like any fan – I have my own sporting prejudices but, try as I might, I cannot understand the serious disquiet over FC Ingolstadt. It’s truly beyond me. In certainly no reflection on their own club but, witnessing the reaction from two St Pauli supporters in their initial meeting with four of my Bavarian friends last Christmas, wasn’t quite what I’d expected. Here they all were, six Germans, all in London to watch football. When it was established two were pro-Bayern and two Schanzer. The latter received little more than curt response. At the time I didn’t probe but could see the resigned look across one of the victims faces. Among others, after our arrival in Germany; when I first met a colleague of my wife – a passionate life-long Hamburg fan – his disbelief that his side might be replaced, in the top tier, by an upstart outfit almost had him foaming at the mouth. From a beautiful walled city on the banks of the Danube, FC Ingolstadt 04 are a young club, created by the merger of two other sides in 2004. Both of those clubs had also gone through numerous name changes and mergers in the past but; when ESV Ingolstadt were staring bankruptcy in the eyes, MTV Ingolstadt’s on-off affair with fußball paved the way for the merger. For ESV this meant total salvation (under a new name), for MTV it would be another five years before they’d reformed their own football department (not for the first time in their long history). Initially playing out of MTV’s Stadion am Kreuztor; FC Ingolstadt 04, began life replacing MTV in level four of the German footballing pyramid. Their second string side took ESV’s sixth tier spot. 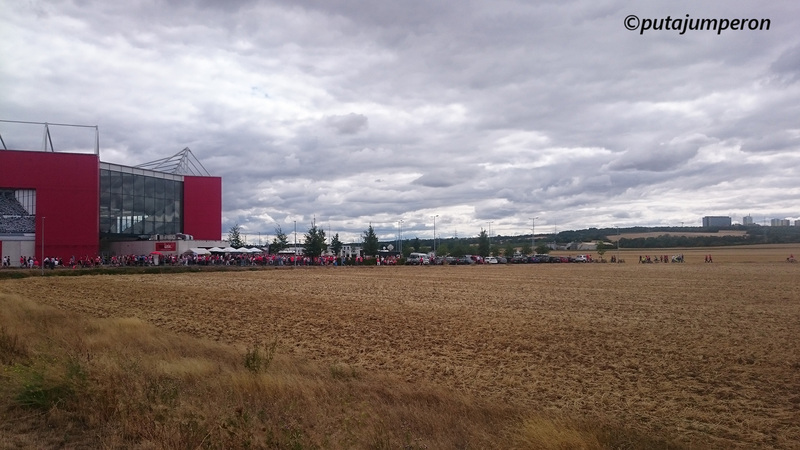 When they outgrew that stadium, they moved temporarily to ESV’s Tuja Stadion (where the Schanzer’s youth sides still play) and now play in a purpose built, yet modest, 15000 capacity stadium on the outskirts of the city. Initially crowds were predictably low for the new club – like practically every sporting merger in history, some hostility lingered though time has healed this wound within the city – but last season gates averaged just below 10000. Pre-2004 much of the footballing support went south to Munich – just a short car-drive away – but now local younger fans are finding belief in their own footballing home. It eleven seasons of steady development; eight managers, three promotions and one relegation eventually lifted Ingolstadt into the Bundesliga, as champions of the second division. As this was only the second major trophy they’d won – the first being the level four, 2006 Bayernliga championship – clearly they’ve not crushed all in their wake. With the Illuminati being too cloak and dagger, in 2006 one of the four major local employers – Audi AG – became a main club sponsor (with approximately a 20% holding) and financial backers to the tune of about €8million per year. This may seem formidable but in the Bundesliga 2, last season, two-thirds of the clubs had far greater financial muscle. In footballing terms all this seems a fairly unremarkable story. Though the club also plays at Audi-Sportpark one could easily argue that the association of a local employer is far more preferential, for supporters, than the numerous multi-million pound backers of premier league clubs from across the globe (see any number of “socially accepted” and “traditional” clubs like Man City, Liverpool, Chelsea, etc…). In the Bundesliga this season, four other clubs have formerly benefited from Audi’s philanthropy, as has one from Bundesliga 2, and at least five massive clubs across Europe. Given Audi are so heavily involved in sport worldwide; if they weren’t also backing their local football club, one would assume there was a bigger debate to resolve than concern over a small club having a local employer as sponsor. Without doubt, there are far more unconnected sponsorship deals and naming rights within the Bundesliga than this one. Avoiding any discriminate order of preference; reading through the Bundesliga club histories alphabetically, most have similar stories to tell to that of Ingolstadt. As a starting point for future debate, FC Augsburg came from a merger between cash-strapped rivals TSV Schwaben and BC Augsburg in the 1940s which was dominated by total distrust between the two parties. Bayer 04 Leverkusen were created from within, and now sponsored almost solely by, the major local employer – Bayer Pharmaceuticals – over one hundred years before Ingolstadt and Audi joined forces. Before Bayern bought out the joint owners (1860 München) of their locally sponsored and built Allianz Arena, corruption scandals filled courtrooms and ultras complained of the new-build being “fan unfreundlich”. Though having the unbelievable fantastic Südtribüne, Dortmund have given up naming rights to the enormous Westfalen Stadion to a mobile company (even though you can’t a signal inside) and have had periods of their history littered with financial troubles. FC Borussia (of Mönchengladbach) spent a few seasons as 1899 VfTuR Mönchengladbach when they unsuccessfully merged with Turnverein Germania 1889 and, in the late 40s rose three promotions to the top tier, in almost half the time that Ingolstadt would. The Kickers and Viktoria of 1899 Frankfurt would begin Eintract’s accent to stardom, before they teamed up with the local gymnasts and then left them again in 1927. Though not having an easy ride at the moment, the massive Hamburger Sport Verein comes from the merger of the Hofenfelder and Marienthaler sportclubs, who then merged with Hamburger FC and FC Falke Eppendorf when all three clubs were severely destabilised by the outbreak of the First World War. Hannover initially tried their luck with athletics and rugby before changing codes and engulfing at least five other club names in their evolution. After beating Southend United, working class BFC Hertha 92 merged with the Berliner Sport Club for extra financial clout, and then had to suffer Hans Pfeifer sticking his oar in. Hoffenheim took just six seasons to rise from eighth division obscurity to the fifth tier in the 1990s, before software billionaire – Dietmar Hopp – returned to his roots, saw a three team “FC Heidelberg 06” merger plan fall through when the other two kicked up a stink, and built a €100million stadium the year before his side were promoted to the Bundesliga. 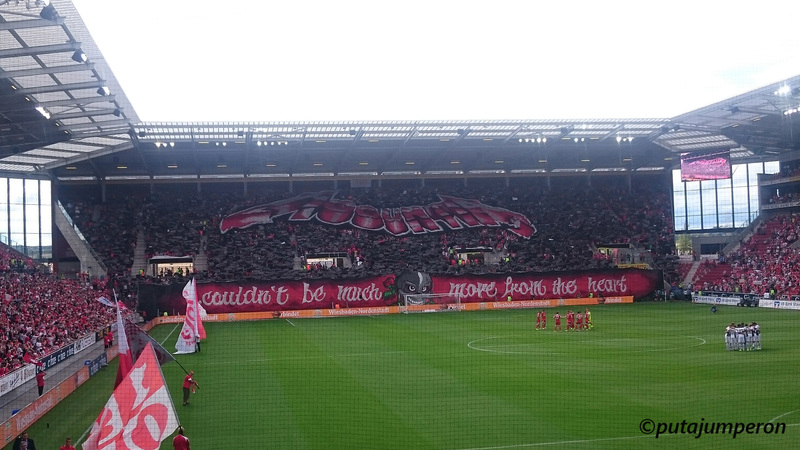 For half that price 1.FC Köln built a stadium which has been renamed more times than New York, after the club was set up by disgruntled gymnasts who then merged their team – Kölner BC – with Spielvereinigung 1907 Köln-Sülz. 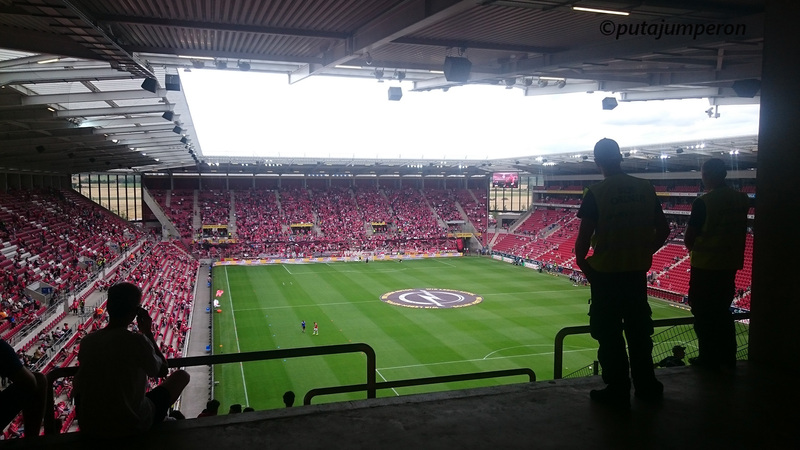 1.FC Mainz 05 too merged and rebranded themselves, before doing it all again after World War II and then, more recently getting a swanky new stadium outside of town. Putting SV Darmstadt 98’s two mergers to one side, their club has been plagued with financial concerns throughout its history but still has risen phoenix-like in the past five years. They have a fantastic youth set up but, Schalke’s stadium is named after a brewery located 100km away and shirts are sponsored by Gazprom which lead to fans urging their club to distance themselves from the Vladimir Putin last year. Mergers, lack of foresight and debt crisis have periodically afforded Stuttgart a rollercoaster life, rebranding and disbanding affected Werder Bremen and VfL Wolfsburg have undoubtedly benefitted from the world’s best-selling car. This is only a snapshot of course but, what does all this prove? Absolutely nothing more than if you scratch the surface, hidden in the tomes of every single club history will be periods of unrest or local business assistance and intervention. They’ll be moments of instability and financial recovery, kit changes, new stadia, rebranding, sponsorship naming rights and new badges designs, and all these will have caused disagreements both within the club and/or the community. So who is in the right? 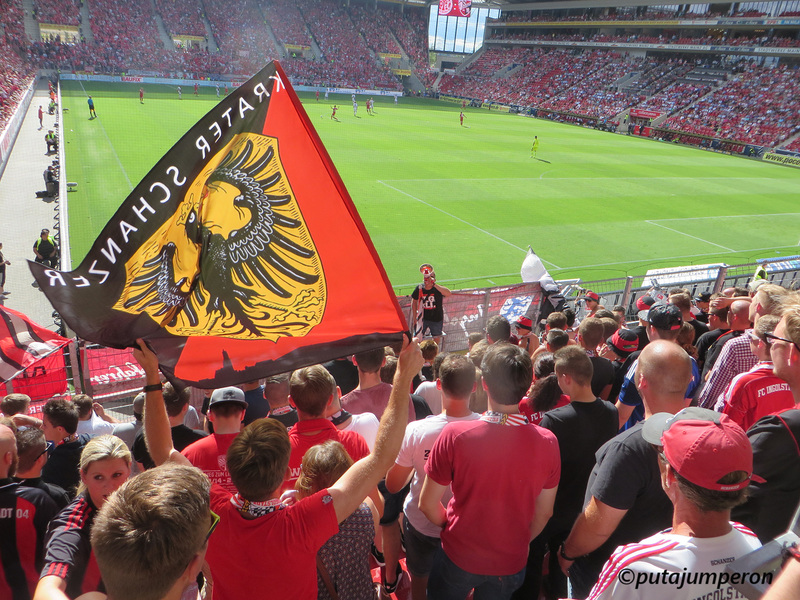 When you stand in with the Ingolstadt supporters, the most striking aspect – naturally three Scotsmen aside – is the utter youthfulness of those about you. In most football clubs, the average must be somewhere between forty and fifty. At Ingolstadt… you could probably knock fifteen years off that. When Liverpool were ruling Europe, practically the entire Schanzer weren’t even born. They are – and truly I mean no insult in this – just kids in comparison. They’re still learning how to survive in this footballing universe. Yes, yes, some ESV and MTV fans will have migrated to FCI but – whilst the older city population probably forged strong footballing allegiances to the north, south and west – these united younger fans are being born into a new world, right on their own doorsteps. Other fans can look at them with misguided prejudicial bile but it wouldn’t be deserved. Unless someone can offer me further evidence I’d suggest it’s probably only out of envy. As fans, we should try to understand our own club histories and shortcomings before criticising others. Maybe then we’d realise that one of us are perfect. 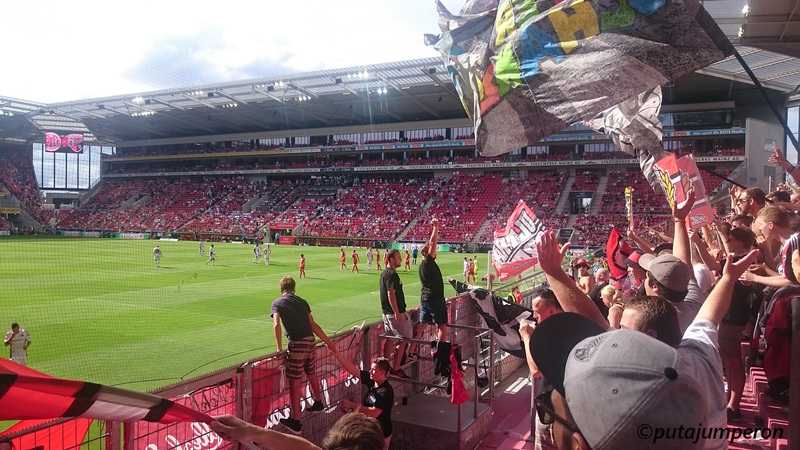 Whatever way you look at their case, FC Ingolstadt’s only crime appears to be being young, enjoying some success and of course, running out the ACDC’s Thunderstruck. 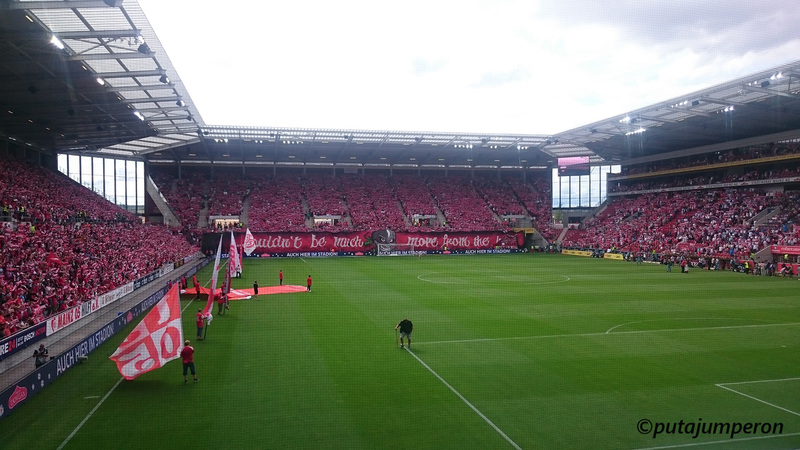 This entry was posted in 2015-2016, Bundesliga and tagged 1.FC Mainz 05, ACDC, Audi, Audi AG, Bayernliga, Bundesliga, Coface Arena, Die Nullfünfer, ESV Ingolstadt, FC Ingolstadt 04, Ingolstadt, Mainz, MTV 1881 Ingolstadt, Robert Elms, Schanzer, Springsteen, Tifo, YNWA. Bookmark the permalink.